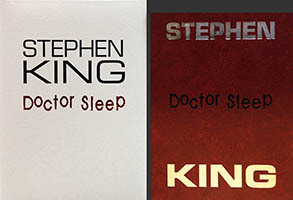 In an interesting move to capture the growing remarque market, Cemetery Dance annouced in February 2013 that they were allowing 100 customers to get their copies of Dr. Sleep remarqued by Vincent Chong for $199. Those customers would have the original art tipped into the book. Then in March they opened up the same option for Erin Wells for $149. A couple weeks later they annouced a THIRD remarque option for Glenn Chadbourne at $199...Chadbourne did not actually illustrate the limited or gift editions, but he contributed drawings for the end papers in the gift edition. 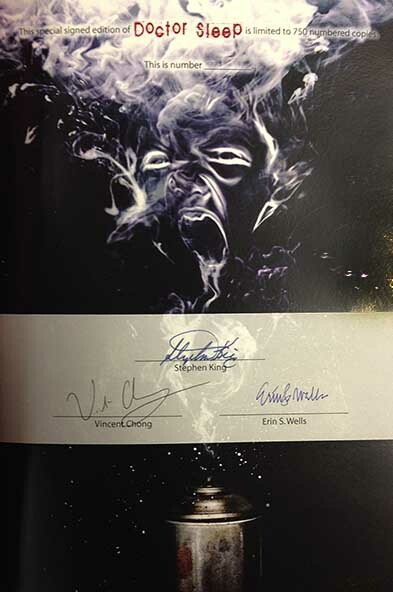 This means, if someone opted for all three remarques in the limited edition they wound up paying $450 + $199 + $149 + $199 = $997 plus shipping for a copy with all three remarques. Interesting enough that's more money for the remarques than for the book. Considering that unremarqued copies are going for $650 - $750 I'd expect folks will be able to recoup their investment, but it remains to be seen how much these copies will wind up selling for on the open market. So far, no copies will all three remarques have shipped out to customers yet. Personally, I got all three remarques in my copy. I though the third remarque was a bit of overkill as Chadbourne was barely involved in the project but I was already invested in the first two & felt (grudgingly) compelled to get the third to complete the set, so to speak. Time will tell if that was a smart move or not.